Modern society is a surveillance society. Our lives are logged, categorized, indexed, and stored for later use by a variety of government and private entities. 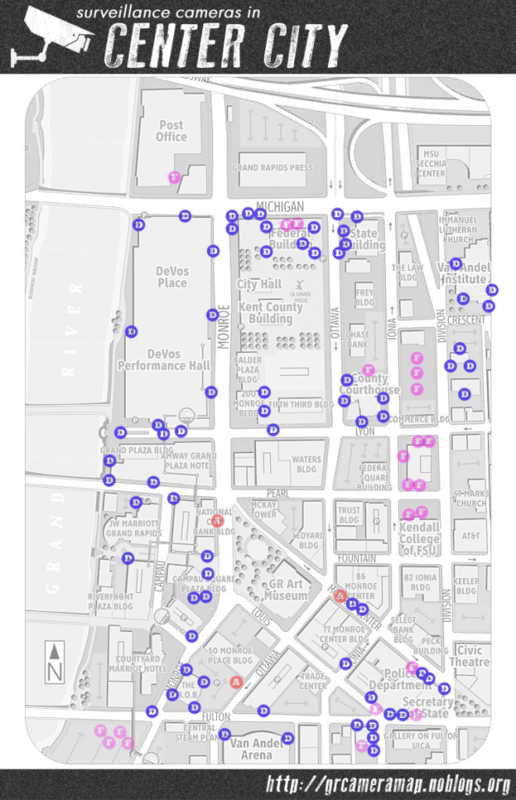 From cameras that record our movements as we travel throughout the city on foot, in cars, or on public transit to the databases that track the flow of money and data throughout the economy, technological advances mean that in a modern city, there are few places where we can be free from its gaze. Surveillance takes many forms, from the largely unnoticed electronic surveillance that happens each time we log onto our computers, update our social networks, or search for our favorite recipe, to the more obvious accumulation of consumer data that happens as our financial transactions are mapped, routed, and analyzed by data-mining systems. In the urban environment, we encounter surveillance society through the network of video surveillance cameras that dot the landscape of Grand Rapids and other mid-sized and larger cities. Surveillance cameras—like all forms of surveillance and security—exist to control and manage society. Surveillance is so omnipresent that it has largely ignored, a projection of power and a disciplining force that few recognize. The great myth of video surveillance is that it will keep us “safe”—usually defined as lessening crime. In the early 2000s, video surveillance cameras (often called Closed-Circuit Television (CCTV)) spread rapidly under the guise of anti-terrorism. As has happened over and over in the history of the United States, a crisis situation was used to expand state power and control. Moving beyond terrorism, video surveillance systems were promoted on the idea that they would reduce other types of crime such as theft and vandalism. However, studies on the topic have largely concluded that cameras have a limited effect on crime. Proponents of video surveillance nonetheless cling to the necessity of building ever expanding networks of surveillance, arguing that there is always the potential that surveillance could prevent crime. And after all, if we weren’t doing anything wrong, we have nothing to fear. Video surveillance is an extension of the apparatus of state control, another means through which we are regulated and disciplined in modern society. However, they are largely missing the point. Video surveillance networks are not something that exist to protect some mythical unified citizenry. Surveillance is not neutral, it is a projection of power. Video surveillance is an extension of the apparatus of state control, another means through which we are regulated and disciplined in modern society. When CCTV systems are operated by private companies, they extend the power of the capitalist system and methods of control, which is essentially what the government systems are protecting. Video surveillance does not exist to protect everyone who moves within a city, but rather, like all forms of security under capitalism, exist to protect those with money and power. This is why video surveillance systems are deployed at relatively predictable sites such as government buildings and financial institutions. 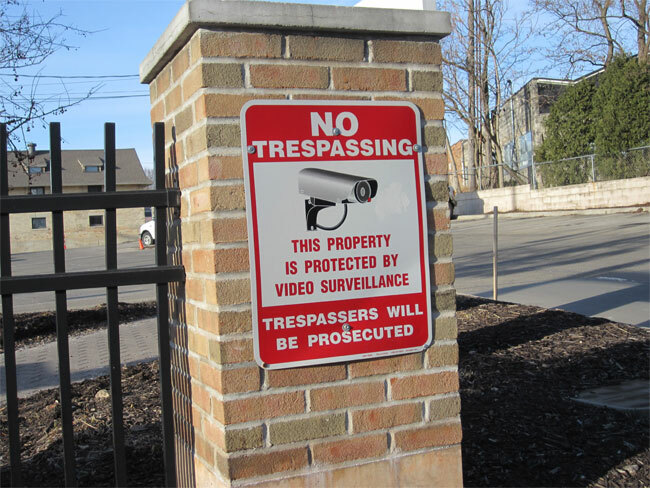 Video surveillance is used as a way to control and regulate behavior in an urban environment. Surveillance exists to encourage populations to self-regulate their behavior, as at any time, anyone could be watching. This is of course true as surveillance becomes more ubiquitous and increasingly large numbers of people carry with them smart phones and other devices that track their movements. 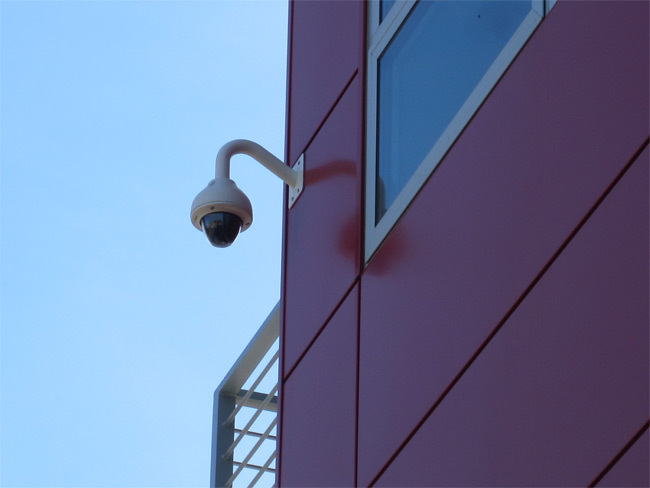 However, CCTV systems are designed to intensify the effect, even to the point where so-called “dummy cameras” are often used in place of real surveillance systems. Surveillance society relies in part on our internalizing the idea that “anybody could be watching” while at the same time ensuring that in some capacity, someone, somewhere likely is watching. In urban areas, video surveillance systems are also often deployed in areas undergoing the process of gentrification. In these cases, surveillance is used as a means of controlling public space. It is designed to lessen the presence of “undesirable” populations in the urban landscape. The surveillance camera outside the artisan bakery helps to deter homeless people from sleeping in the doorway. The surveillance camera outside the market-rate apartment helps give the illusion of safety and reinforces the “frontier” mentality often invoked by developers. 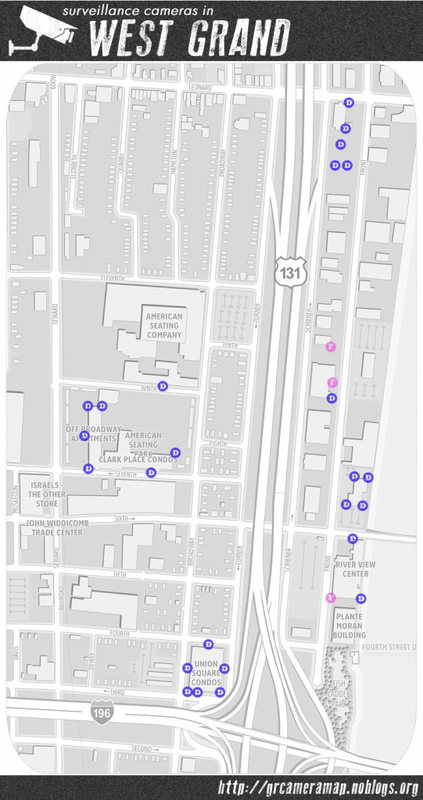 Like most mid-sized and major cities in the United States, the landscape of downtown Grand Rapids is watched at all times by a mix of public and privately owned surveillance cameras. These systems reinforce existing modes of power. Surveillance cameras surround government buildings, such as the Gerald R. Ford Federal Building, and appear outside (and of course inside) banks and other financial institutions in downtown Grand Rapids. Video surveillance in downtown features is a mix of camera types (fixed, dome cameras, cameras on ATMs, traffic cameras, etc). Reflecting how power functions in society, cameras are operated by both the government and various private entities. For example, the Michigan Department of Transportation (MDOT) operates traffic cameras. Of course, in the neo-liberal city where the distinction between public and private is often blurred, the actual operators of the cameras tend not to matter much. 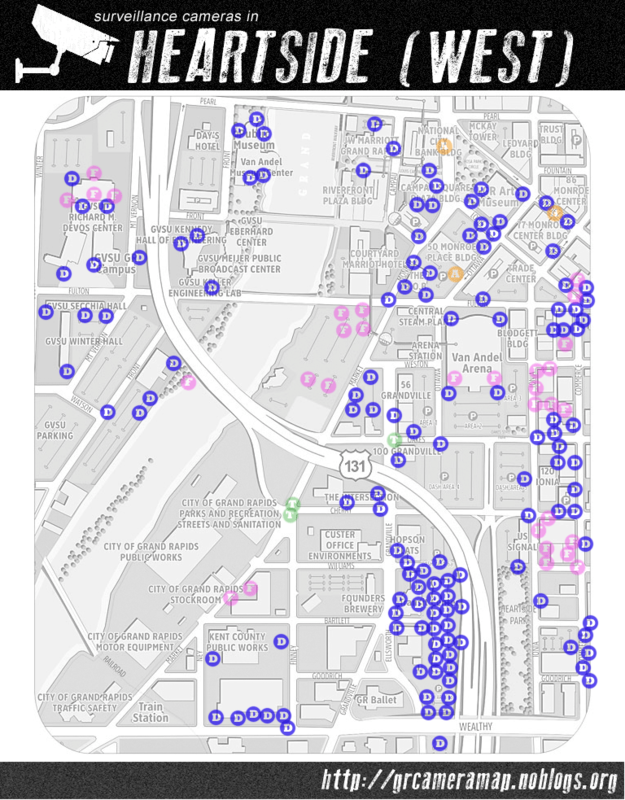 The City of Grand Rapids, Kent County, and the Grand Rapids Police Department (GRPD) launched a partnership in 2014 to give the police real-time access to many of the privately operated security cameras in downtown Grand Rapids. It is largely unknown which businesses are participating, as there is a non-disclosure agreement in place. As is always the case with surveillance systems, the push is to expand the program, with the City and county pursuing grants from the Department of Homeland Security to expand the system. 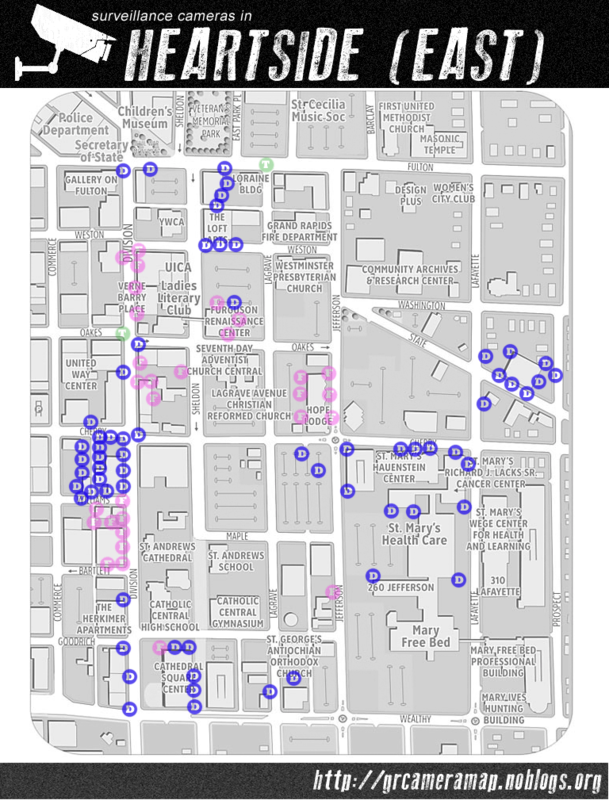 As in other cities, video surveillance in Grand Rapids exists to control urban populations. 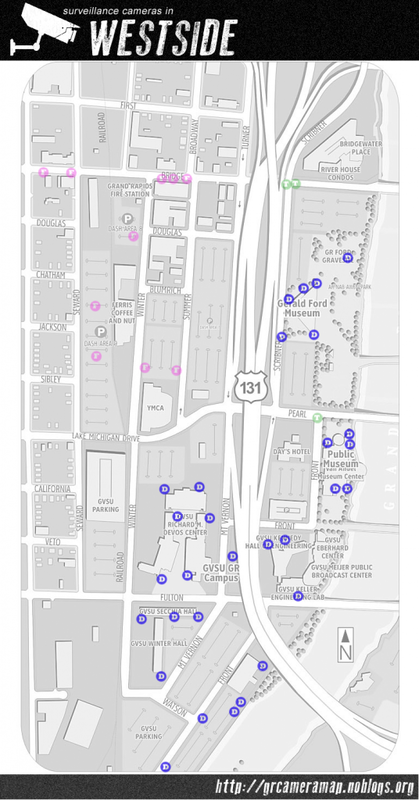 While the Grand Rapids Police Department claims that it only operates one surveillance camera in downtown Grand Rapids at Pekich Park – it is an area where many low-income and homeless people congregate. As new housing developments, restaurants, and stores have opened in downtown, they are frequently monitored by video surveillance systems. Comparing data from 2004 to 2014, this is especially true in areas such as the South Division corridor. These cameras work in concert with other forms of surveillance, including police patrols, private security, the Downtown Ambassadors (who regularly track and record data about “suspicious people” in downtown Grand Rapids and communicate with the police). Surveillance is used to police public space and create a climate where only certain individuals are welcome. Beyond the visible cameras, it’s safe to assume there are hidden cameras as well, as surveillance technology has become increasingly smaller and easier to hide. Cameras are used regularly by the GRPD in their patrol vehicles and the Department is undergoing a pilot program that will eventually equip each cop with a body camera. Police also make use of automated license plate scanners, recording the license plate numbers and locations of vehicles in the city, storing the information for a year. 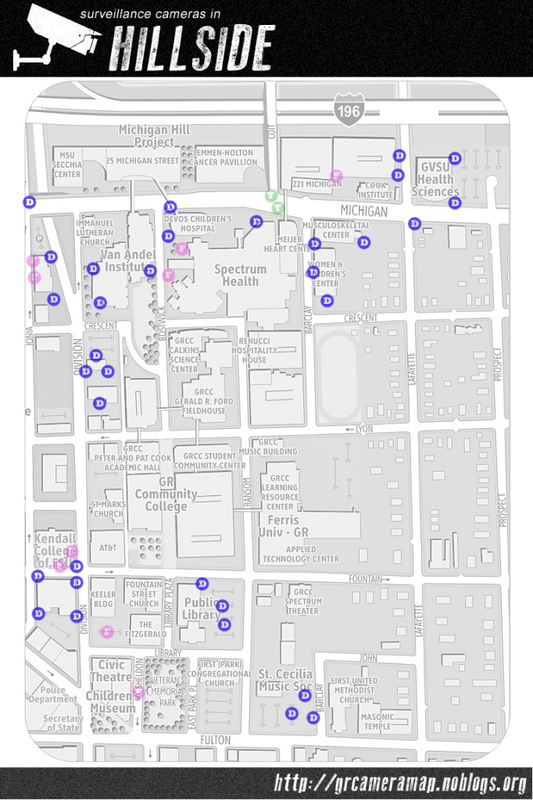 In 2004, an alternative media group called Media Mouse produced a report that mapped visible video surveillance cameras in Grand Rapids. In 2014, another website published a series of maps documenting an increase in the number of surveillance cameras. Previous PostPrevious When’s It Gonna Stop? Next PostNext What Is Market Rate?